Organize all of your materials together in a professional and very impressive presentation folder. Presentation folders can be used for sales material to hand out to prospects, at seminars to organize your printed material and also as a membership package for current customers. If you have a lot of printed materials don’t go to your next meeting without a presentation folder to keep it all together. Our graphic designers will help create a presentation folder that is consistent with your brand identity, including your logo, color scheme and key elements to share with potential or existing clients. 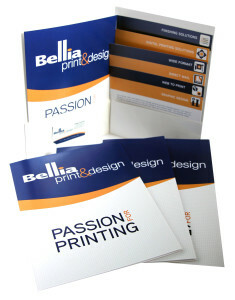 Our team will help design, print and assemble all the components of your new presentation folder. Paper Stock – Most commonly we’ll use a durable paper stock, 14pt Gloss Cover. Color Impression – We can design and print folders in full color on both sides, full color on the outside with black & white on the inside, or full color on the outside with no color impression on the inside. Aqueous Coating (AQ) – This is a semi-gloss, environmentally friendly, water-based coating applied over the entire front and back of the printed piece. It provides additional gloss and protection, and it can be written on with a ballpoint pen. Ultra Violet Light-Cured Coating (UV) – This is a high-gloss coating applied over the front of the printed piece. It is not recommended for printed material you need to write on after being produced. Stepped inserts are a very appealing and effective way to present an organized presentation. The inserts are a set of flyers that “step” down from tallest in back to shortest in front. The stepped inserts can be in increments of 1/2″, 3/4″, 1″ or 1 1/4″. Highlight your company’s offerings and benefits this way as an excellent marketing approach. Fill out a quote request form or call us today to get started with your Presentation folder project today!